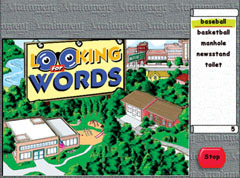 This fun community exploration software program combines reasoning skills with vocabulary building. Engaging graphics, interesting animation and clear speech help teach hundreds of words in context. The program features "explore, "list," and "picture print" options. In "explore," students freely move to different locations, 24 in all, learning new words as they go. Select any object and it identifies itself. In the Living Room at home, click on "lamp," "fireplace," or "window," for example, and each word appears in text and is pronounced. In the Music Room, click to hear sound effects for "saxophone," "piano" and "drums" among others. In the "list" option, students search for specific words on their list (randomly or teacher chosen). Where would you find a basketball, broom or mailbox? How about a fire hydrant, fire truck or toaster? Use the "picture print" option to create student activities or illustrated vocabulary booklets. New feature lets teachers select specific words on student lists. Scores are saved to track skill development. Requires Macintosh system 7 or higher, Windows 95 or higher.